Two new storm resilient boats will join the Staten Island Ferry fleet funded by $190M in federal money. ST. GEORGE — A pair of new boats worth $190M are to join the Staten Island Ferry fleet. Senators Charles Schumer and Kirsten Gillibrand were joined by Mayor Bill de Blasio to announce more than $190 million in federal funds for the two new boats, along with flood-proof upgrades to the ferry's facilities and landings and upgrading of other landings across the city. "Following the unspeakable devastation on Staten Island wrought by Superstorm Sandy, with this massive federal investment — that we fought so hard to secure — we can truly say that Staten Island’s ships have come in,” Schumer said in a statement. 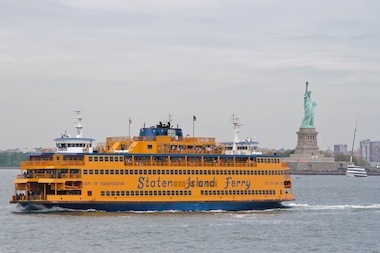 “After Sandy, we were again reminded how important ferries are to our transit system during emergencies, and that’s why we need modern, resilient and reliable ferries that our Staten Island commuters and emergency response personnel can rely on." The new, 4,500-passenger ferries will have four modern drives that, with side doors, lets them operate in more extreme weather and dock at other terminals in the city in emergency situations, the mayor's office said. They will replace aging boats including the 33-year-old Andrew J. Barberi and Samuel I. Newhouse boats as well as the nearly 50-year-old John F. Kennedy, reportedly the most reliable boat in the fleet. "The Staten Island Ferry is a lifeline that’s vital to New York City’s economy and to the health and safety of our people," de Blasio said in a statement. "These upgrades will improve commutes for thousands of Staten Islanders and ensure we have more reliable, more flexible ferry service when emergencies strike — a key part of our comprehensive resiliency plan." Hurricane Sandy disrupted service on the ferry for five days, and left damage at both the Staten Island and Manhattan terminals. Escalators at the Whitehall terminal were out of action for more than a year. Aside from the new boats, the money will also fund upgrades to the terminals to protect against future Sandy-like damage. It will also be used to modify the landings at four locations in the city to accommodate the new fleet and harden them against future storm damage and sea level rise, the mayor's office said. The upgraded landings will be at Hunters Point and E. 34th Street, with another two which have not yet been determined. One will likely be in Brooklyn, the mayor's office said. They will also create two "flex barges" that can be deployed in multiple locations, in addition to the four upgraded landings, with the funds. The new boats and upgrades will be funded by the Federal Transit Authority's Sandy Relief Bill.